I didn't take weekly or even monthly belly pictures during my pregnancy nor did I have a maternity photo shoot. Not because I didn't like both ideas, but because turning up on a regular basis in the same place, at the same time of day, in a similar outfit each time with cutely printed "Week __" sign and Greg to take the picture was just not in the cards, and I never made finding a professional photographer and scheduling a session a priority. There were just too many other things to take care of first. So while I have pictures of me "with" Peanut, I don't have the thorough documentation I thought I might. I took this picture of my 39 week 4 day tummy just in the nick of time as my water broke (sort of) at 4am the next morning and about 23 hours after that I was holding little Ida. And I'm so glad I took it as I think its the only bare bump shot I have. Now when I look at it I feel proud of my body for growing the healthy, vibrant little human it did and thankful for the opportunity to experience pregnancy, birth and motherhood. Four months before I found out I was pregnant with Ida, I had a miscarriage at six weeks. Greg and I had been not not trying to have a baby for over two years. Nothing was wrong. It just wasn't happening. And then suddenly it did. Suddenly I was staring at a positive test, feeling the joy and fear of the unknown that are probably standard issue. Are we ready? Will we be any good at this? Exactly what do we do? Now? Eight months from now? After that? Another unknown, maybe no less common source of fear than the others, which quickly became a nagging obsession for me, was how my body would change during pregnancy. I was terrified of baby weight, stretch marks and loose skin. I spent hours googling images of postpartum bellies, searching desperately for reassurance that my stomach wouldn't be "ruined" and trying to find consensus as to the best method or magic potion to prevent it. Then, before I had fully wrapped my head around the tiny little person-to-be inside that stomach I was so worried about the appearance of, but not before I had integrated him or her into every thought about the future, I started spotting. We went to the doctor. We saw a tiny heart beating. A couple of days later the spotting became heavier bleeding. We went back to the doctor. Baby was gone. No more tiny heart beating. As suddenly as it had happened, it was over. As my hormone levels plunged over the following couple of days, trying again seemed completely off the table. It just wasn't worth the agonizing worry followed by the heartbreaking emptiness should the same thing happen again. On top of that, into that emptiness had rushed a hatred of all mothers, mothers-to-be, and their perfect, healthy, living babies with hearts thumping away in their little chests. How could I want something I now despised? It just didn't make any sense. And then the fog lifted. Things leveled out. And I wanted nothing more than to try again, to be healed by the sight of another positive test, the renewed dream of a future with a child. Four months later, I was holding that positive test and once again imagining how it would all go, trying to see past the long shadow of doubt to the other side. It was impossible to keep the fear that something would once again go wrong properly tempered with hope and positivity while simultaneously keeping hope and positivity properly tempered with the reality that something may very well once again go wrong. Balance was impossible for long, with fear often winning out and consuming my thoughts with worse case scenarios. Despite everything, despite losing my first baby, despite the fear of losing the one I was now carrying, despite my immense gratitude for getting pregnant again and so quickly, fear about the "toll" of pregnancy on my body soon crept right back in to mingle with all the others. After recovering from the miscarriage I had thrown myself into running and yoga and had gotten into perhaps the best shape I'd ever been in. I couldn't wait for my bump to appear but at the same time I was acutely grieving the figure I thought I'd likely never see again, the six pack I had foolishly thought I might be headed towards that would now certainly never be. And then spotting again. I honestly don't remember if we saw the heartbeat that first time at the doctor. Still some spotting. I'm sure we must have seen it the second. Still spotting, but nothing heavier. A waiting game. And then it went away and never came back and I went on to have a normal, healthy pregnancy. Somewhere in there I came to terms with the almost complete lack of control I had over most aspects of my journey towards and hopefully into motherhood. This left me to take comfort in a concept I had learned in my yoga practice, the concept of Ahimsa, literally "non-violence", but as explained to me by a teacher, more accurately described as "loving kindness towards all living things, including and beginning with oneself." I stopped looking for pictures of postpartum bellies that I deemed flat enough to be worthy of admiration. 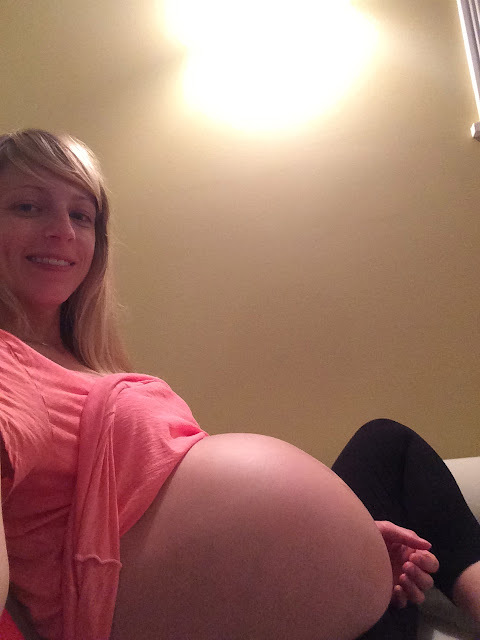 I started looking for ways to accept the changes that would come if I stayed pregnant. In my searching I found one particularly sane voice, Jennifer of Mama Lion Strong that I've been following ever since. In March she helped to found a fantastic (closed, you just have to ask to join) Facebook group, Healthy Habits for Happy Moms. Mama Lion Strong and the group are both all about health, both physical and emotional, balance in nutrition and exercise, and cultivating healthy body image for a sustainably happy life. No particular programs or diets are endorsed, and their promotion isn't allowed in the group. The group is just a great safe place to ask questions, share the good and the bad, and connect with other women. And in the few months I've belonged I've learned a ton about myself and how to approach my own journey into motherhood and beyond. Above all, I really, really want to be a good role model for Ida. I don't want her to grow up watching her mother struggle with a dysfunctional relationship with food and/or exercise, swinging back and forth from feast to famine in regards to either. Nor do I want her to grow up listening to me berate my body or the bodies of other women for not conforming to the "ideal" depicted by glossy pictures in magazines (or on a computer screen). Because before she starts reading those magazines or surfing the web, before she's in school or on social media, she'll begin to learn how she should think and talk about her body from me, studies prove girls learn the most from their moms on this one. And I don't want her to grow up thinking that as a woman she will always have to strive to "fix" what's wrong, I want her to love herself always, to be healthy always and to be happy always. So, little by little as we settle back into a normal routine in our new city in our new home I'm building the foundation to show her the way. And maybe some day when it's her turn to become a mommy, she'll be free to just plain revel in it.